Rather than killing rodents, RodentStop works by blocking their access with an innovative barrier formulation. The ecological benefits of RodentStop also make it ideal for use as part of an Integrated Pest Management (IPM) approach. It helps the user to effectively and humanely manage the problem of pests without having to resort to the use of chemicals. The versatility and flexibility of RodentStop makes it ideal for use in a wide range of locations. It can be effectively incorporated into both new and existing buildings and is particularly well suited to hygiene sensitive areas such as food manufacturing and preparation facilities. 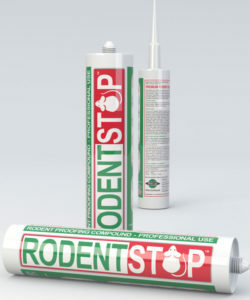 RodentStop is quick and easy to apply onto many surfaces, is instantly waterproof, and unaffected by extreme temperatures for use both internally and externally. For more information please read the brochure here.